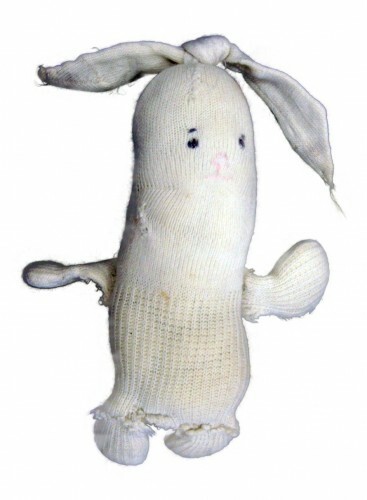 Welcome to the Sock Bunnies website. Hi, I’m Jessica Emmett. In 2006 I created a project as part of an art Whisper Residency at the Chinese Arts Centre. Much of my art examines adoption and my own experiences of being a Vietnamese/Hong Kong transracial adoptee. This particular work was done in response to being fostered for a short time before being adopted at 12 months which you can find out more on the [ABOUT] page. My frostier family gave me 3 things, my first and middle names Jessica Jane, a hand made sock bunny (the bunny on this page) and a set of foster photos at different ages during my time with them (can be seen on the [ABOUT] page). As part of the residency I asked people to donate second hand socks which I created into 20 bunnies using roughly the same technique as the bunny I was given, which you can see on the [BUNNIES] page. The main aim of the project was to present a more realistic adoption process and challenge peoples preconceptions about adoption. I invited people to become bunny adopters and created the website to support the bunny adoption process. You can see a more in death look into the concept of the project on the [RESIDENCY] page. I thank all that contributed and and for anyone that has made a bunny from my instructions… would love to hear from you. I also would love to hear from other artists that deal with adoption in their works. If you would like to contribute, update, comment or just plan curious about the project please feel to email me on the [CONTACT] page.